When purchasing hardwood flooring, consideration should be given to the edge detail of the boards that you are purchasing. 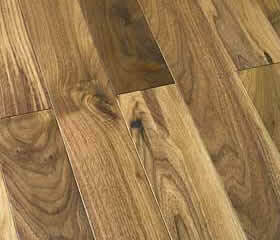 Figure 1 shows an American Black Walnut flooring using 3 3/4 inch random length boards. There are four basic hardwood flooring edge details. Some manufacturers may not make all four varieties, while others may only provide edge detailing on the length of the board and not at the ends. In most cases the edge detail only provides aesthetic value. The edge detailing outlines the board providing it with definition. The edge detailing was created by manufactures that produced prefinished hardwood flooring, as the beveling detail compensates for any small variations in board height when one board is placed against another board. Figures 2 shows one flooring board slightly higher than the board beside it. Although the height difference is very small, it is still visually noticeable and it would be noticeable underfoot. Figure 3, shows two boards side by side with the same variation in height as shown in Figure 2, but the boards have a bevel in them. The bevel has the effect of eliminating the visual height variation and there would be no feeling of height variation underfoot. As well, some flooring experts believe that not having an edge detail can lead to small splits on board edges which can catch socks. It should be noted that many homeowners believe that having a deep edge detail provides a place for dirt to accumulate and makes cleaning the floor more difficult. Square edge (Figure 4): Usually found on hardwood flooring that is to be finished on site. Microbeveled edge (Figure 5): Provides just enough relief on the edges of the board to eliminate edge splitting and micro variations in finished board heights. It should also be noted that a microbeveled edge will most likely disappear when the hardwood floor is refinished. Eased edge (Figure 6): A middle depth and width edging. Beveled edge (Figure 7): The deepest and widest beveled edge made.